The Malle W. Trousseau assembles a careful selection of utensils and devices that are essential for enjoyable cooking: objects that are designed above all to be used, and not just to please the eye, even if they do that too. Over the years they have made their selection based on a tool’s intrinsic integrity and practicalityThe Malle W. Trousseau has three focuses: cutting, cooking, containing. Who hasn’t cursed the ‘good’ knife that won’t cut, the warped chopping board or the dishcloth that doesn’t dry? Maybe this is because nowadays, we live in a world where objects are made to be consumed and then thrown out. The objects presented in the Malle W. Trousseau collection are made by craftsmen with a genuine savoir-faire and love of their craft. The objects they have found over the years are timeless and they will soon became an integral part of your household. 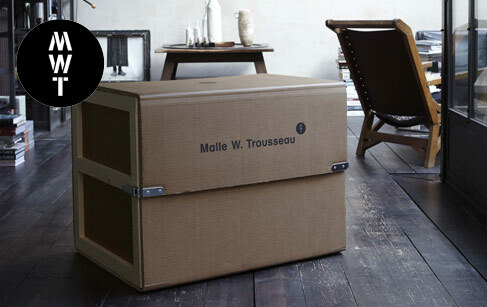 So, it is natural to ask Malle W. Trousseau where the idea of grouping their products together in a trunk came from. The answer is that when their daughter Dalva was leaving home, she asked: “Can I take the Corsican knife and the chopping board that Jules made and…” And that reminded the team of the trousseau that their grandparents would receive when they got married. Fashions have changed. But the idea of offering the best that will last a lifetime is a hugely generous act in itself and inspired them to create the Malle W. Trousseau. And what’s with the W? It’s a reminder of the travellers’ initials that adorned their trunks long ago. The Malle W. Trousseau is the gift of a lifetime, for a lifetime.